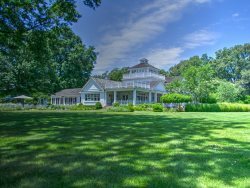 Bird Dog Run is a recently renovated Victorian farm house just outside the town of St. Michaels. Located on Harris Creek, the property offers room to roam for both dogs and owners. Enjoy amazing sunsets while relaxing around the pool or by the shoreline while sitting in one of the many Adirondack chairs. The Victorian home features 3 bedrooms with the ability to sleep multiple families. Several different seating areas will allow you to find seclusion and catch up on your reading or just escape with your thoughts. If you enjoy cooking, you'll appreciate the upgraded kitchen where you can create some delicacies and share them in either the formal dining room or the casual seating area located in the solarium. Bird Dog Run offers both privacy and country comfort, yet is only minutes away form the shops and restaurants of St. Michaels. Water Toys Included: 3 kayaks (1 single, 1 tandem, 1 children's). To ensure proper sizing for your group, please bring your own life jackets, or we can recommend a rental agency. Beautiful waterfront home with all the amenities -- inside and outside. Upgraded kitchen, baths and large comfortable bedrooms -- we had plenty of space for our large family. The outdoor space is amazing. Incredible views at sunrise and sunset. Swimming, fishing and crabbing...all onsite. So much to do -- we didn't have enough time to try everything! We can't wait to come back. We highly recommend this property for your next family vacation. What an idyllic setting for our group of friends to enjoy the Eastern Shore! The beautiful historic home comfortably accommodates 2-3 families with a newly renovated kitchen and updated baths along with plenty of comfortable sitting areas throughout the house. The outdoor space is spectacular with views of Harris creek from several patios, hammocks, and an outdoor pool. There are plenty of activities to enjoy on the property itself which are easily complemented by the myriad of activities available in the St. Michael's area. I highly recommend this wonderful property to those who want to get away from it all! This house has it all and our family enjoyed all aspects of this beautiful waterfront property. The house is renovated with a state of the art kitchen and wonderful gathering spaces. We also enjoyed the pool, game room, and kayaking in the inlet. We rented to the house for a long weekend with several families and there was plenty of room for everyone. We will be back soon! Also it's only 2-3 milies from St Michael center of town, so its a nice bike ride into town.